That’s the wish from my side, I’m glad that this year is going to end soon and the new experiences are waiting for me… and everybody! Santa Claus didn’t visit us this year either but I was happy that he had brought also this year some nice presents! :D Headlamp and skibootdryers on the top of that. And my boyfriend got a book from his ”german”family: ”die spinnen, Die Finnen” so I think I’m going to read it at once!! :) Otherwise my Christmas went pretty much normally, including delicious eating, skiing and relaxing and this year even Christmaschurch on 25th! That’s because I spent first time ever my Christmas’ Eve somewhere else than by my parents’. i was by my bf’s parents so that was certainly something new! It’s nice and weird to see how Christmas’ Eve is celebrated elsewhere! Anyways, what happened earlier in this month made me feel a bit down. 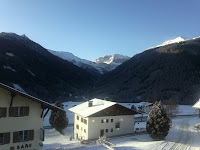 As you know I traveled up to the Alps to participate IBU-cup races in Ridnaun and Obertilliach. For me they turned out to be a disaster which seems to nearly cut my season short. We spent the first 5 days in Obertilliach where we were able to acclimate to the higher altitude and also train properly on the nice 5K’s track! We got also more snow on the second day so it looked really nice after rain and darkness of the homeyards. First in the program was individual race and 15K in +2 cloudy weather. i was feeling lazy and My body didn’t have that much energy due to stomachproblems, so with 6 penalties and this skiing- you move nowhere. Head down and shoulders front, and shaking legs. Unsatisfied and sad. In sprint however I managed to relax on the shootingrange and Igot a prefect shooting 0+0 at the first time since 2010. I felt a bit better than the previous day but it wasn’t enough to get any good placement. 51th was far away from the result I know I can with that shooting. The fastest skier of us will ski World Cups in January, and the winner of the small national race here in Kontiolahti during December will have starts both in IBU-cups and finally in Antholz. And all these decisions I find a bit unfair, but You cannot do anything but ski faster. We don’t count shootingtimes or hitprocent, nope. Even if we were biathletes. but all this aftertalk is pointless and will only waste my precious time. Keep your head up, have a rest and good training and you’ll show them it was a mistake to cut you off! Fingers crossed to be back soon!